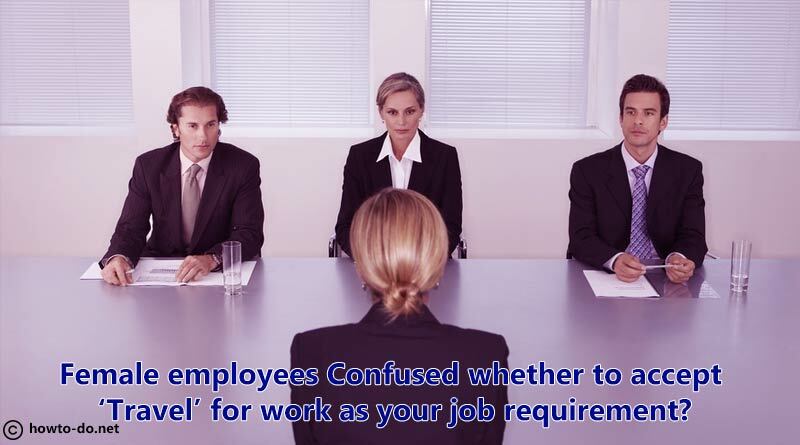 Female employees – Confused whether to accept ‘Travel’ for work as your job requirement? Getting a desired job fulfilling each and every condition is not possible. There will be scenarios where you need to think twice whether you need to accept it or let it go. The similar situation happens in case of female employees where they are confused whether to accept “Travel” for work as their job requirement. If the job description states that the work profile requires travel, apply only if you are willing to travel and able to do so without any dependencies. It is always important to do your part of research about how much travel is typically involved so that you can promptly answer this question when the need arises. For example, if you are applying for a job of the technical recruiter or pre-sales consultant you should be rest assured that you will be doing a lot of traveling to make this choice wisely. It is always better to stay things honestly rather than beating around the bush. Be upfront about how much travel you can do during any given time frame. Be sure to frame your response in such a way that it shows what you are capable of, demonstrating flexibility and end your discussion by asking the reporting manager to offer more details on the travel related requirements. Female employees that are ambitious or value their professional growth enjoy travel for work as it not only helps in improving interpersonal skills and communication but it gives them the confidence to take up more challenging assignments. Travel for work can be tricky for female employees who are handling social and family responsibilities. Travel for them is a huge task as they have to stay away for a substantial period from their family or social life which may not go down well with them. In short, travel could prove to be a tricky proposition for female employees that have different career aspirations. We have listed some of the pointers female employees take into consideration when they accept travel for work as their job requirement. As it turns out, travel for work is a tricky proposition and it leaves female employees confused whether to accept it as their job requirement or not. Acceptance of travel in a job is subjected to a female employee’s career goals and objectives. Make sure that you are yourself very clear whether you would be willing to travel frequently, a limited number of times or not travel at all so that you can respond to the question appropriately. Do feel free to ask any security concerns you may have regarding traveling or the kind of accommodation you may be provided while traveling.